The term different is a catch-all with gradients and nuance, equally applicable to everything from unicorns to mustachioed hipsters, but not in the same sort of way. Embark falls on that gradient scale of different, a notion we don’t try to hide. In fact, it’s something that we revel in, a distinguishing source of pride that’s as reliable as the ocean’s tides or traffic on a downtown freeway. You see, Embark has no intention of joining the sea of uniformity in the financial space. When your founder and CEO isn’t an accountant and lets a genuinely entrepreneurial spirit carve his path, the resulting firm is bound to be, well, different. For Embark, that has made all the difference in the world, from the top of our organizational food chain down to the newest of new hires. Of course, that’s just a component of what makes us unique, a single ingredient to the secret sauce that separates us from the rest of the industry. Give us a few minutes and we’ll give you another sampling of our special blend of managerial herbs and spices with the hopes that you’ll walk away with something beneficial for your own enterprise. Do we think we know everything and have this thing completely wired? Nope, we will always be a work in progress, just as every company with an eye towards growth should be. But we’ve certainly picked up a few things in our short corporate lifespan thus far that make this place special. Want a small hint before we dive in? It’s all about your people. Embark has engineered nearly every aspect of our firm around talent which, at first glance, seems like an obvious decision that everyone should make. In reality, however, other companies might say they always put their people first but, when push comes to shove, the people are usually the first “cost centers” that firms prune like a rose bush in spring. Emphasizing talent starts at the top and trickles down through policies and procedures, actions and culture that make it clear to all where an organization’s priorities fall. Sure, recruiting talent is instrumental as well, but a steady inflow of even the most innovative minds does a firm no good if the culture is toxic and creates nothing more than a revolving door of talent. And counteracting that corrosive dynamic, our financial friends, doesn’t always lend itself to a robust P&L. 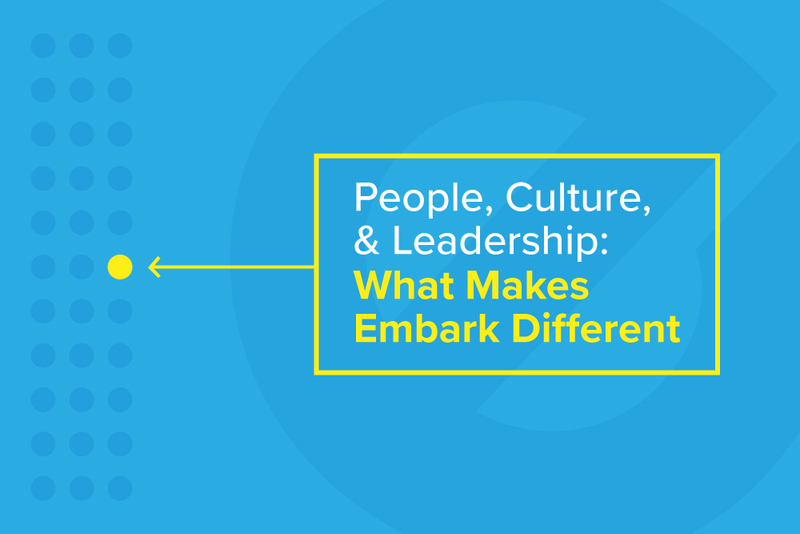 Embark invests in its people, even though it hurts our short-term bottom line. Just like any type of investment, we’re always playing the long game. Through benefits, education, technology, a highly-curated culture, and a non-stop pursuit of the ideal work/lifestyle balance, we’re building a phenomenal place to work, where every employee is a crucial building block to a stable and prosperous future. That’s money well-spent by anyone’s standards. The best talent doesn’t want to sit on their laurels. They want to excel and never stop growing in their knowledge base and skill set. Those are the people that Embark seeks out, the ones that are both talented and motivated to succeed, that never stop reaching for something bigger and better. In fact, our management team must often implement policies to properly throttle that drive, ensuring that it coincides with a healthy and fulfilling life outside of the office. Embark doesn’t want a supernova that illuminates the entire night’s sky but quickly runs out of fuel and goes dark. Instead, we want the steady stars that are the best at what they do, are consistent, and capable of shining bright for the long haul. Those are the team members that an enterprise builds an outstanding, enduring culture with. We continually challenge our team members, both within their individual positions as well as their role in the enterprise. Part of that process is connecting them to the why? part of the equation, seeing how their singular puzzle piece works in conjunction with the others to complete the corporate puzzle, taking daily incremental steps to improve themselves along the way. Development evolves in lockstep with a challenging environment. As we challenge our people, they inevitably continue to develop as they strive for personal and organizational goals. Embark also takes careful consideration to design positions that are inherently challenging, making certain that our talent will never stop pushing themselves to improve. That’s where the investment in our team really shows up, as our people begin to build on ever-increasing knowledge and create a snowball effect that Embark, its employees, our partners, and clients all benefit from. Without that devotion to a challenging environment, the very same snowball effect could have a reverse impact, as seen in so many firms with overwhelming turnover and the accompanying costs involved. Organizations are like wooden ships built for a life at sea, traversing often contentious seas to get to their desired port before they regroup, stock up on supplies, and head back out. Every plank of those wooden ships must fit in seamlessly with one another or everyone onboard is in peril. Embark takes this analogy to heart when choosing who will join our team. Our culture is too deliberate, efforts too meticulous to risk a faulty plank or two from threatening the seaworthiness of the enterprise. To that end, our recruiting begins with two personality tests to see if the prospect is a good fit for Embark, how they need to be developed, and who they would work well with on our team. Ultimately, its the fit within our culture that reigns supreme, far surpassing intelligence, skill, or even experience. Once we find those unique individuals, we hold on to them for dear life, challenging and help to develop them as we go to build something great, something lasting. The way we see it, an enterprise built of the right people that invests in those team members will build a stronger brand, delight the clients, and continue building on itself. That’s the Embark way, obviously a little different than the average firm but, in all honesty, we wouldn’t have it any other way. We’re doing something great over here and being different is the wind in our sails.